Commissioned: My Review | My Journeys Through Life . . . Herding Cats In New Mexico! ← My Craft Room . . .
My kids love to play games, and were very disappointed when we let go of all of ours during our moving sale before going across the country to our new home. To be fair, I gave up a lot of stuff too. After all, when the moving truck company values your life at fifty-seven cents per pound, you get ruthless pretty fast! Every since, I’ve been slowly rebuilding our supply of games, but now I am concentrating on (as much as possible, anyway) educational (but fun!) games, and games that are faith-based. This brings me to the game we have been reviewing! We received the game Commissioned for the purpose of this review. This game was provided to us by its designers from Chara Games, which is a start-up company devoted to publishing high quality, fun board games and card games with Christian themes for teens and up. Chara is the Biblical Greek name for unshakeable joy. To read more about the Chara team, check them out here. Commissioned is Chara’s first game, funded on Kickstarter. Here, you can see a short video of the official “unboxing” of the very first game after production. I thought it was so fun to watch how excited they were to see the completed version after all of their hard work! Commissioned made of very high quality, sturdy materials! The elder staff feels and looks like actual wood, and although I really cannot tell what the apostle pieces, the missionary pieces, or the church member pieces are made of, they are thick and sturdy. The two-sided board (which side you use is dependent upon which game scenario you play) is thick and sturdy, as are all of the punch out tokens. All of the cards used in play are very nice, not cheaply made at all. They feel like they are coated with a protective surface, to me. Full disclosure, I think this game would be pretty difficult for even adults without some real help in learning how to play it. Well guess what? Chara Games has given us exactly that! Here is a how to play video, produced by Chara Games! My kids really like this game so far, mostly “The Artist.” I do feel that as they become more comfortable with it and learn more, the others will find it easier to play, as well. Some other things I really like, besides the quality of the board, the playing pieces and the cards, is the full color, approximately 10″ x 10″ 12 page instruction book, and the 10″ x 10″ 12 page Commissioned Theme Appendix. Within this index, there is a lot of the New Testament history, with the Bible verses to correspond. 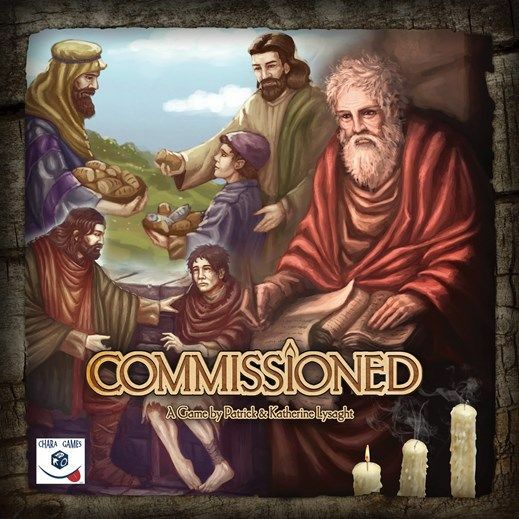 Because the creators of Commissioned understand that religious themes can be difficult, given that there are so many doctrines being taught within different denominations, they have chosen to present the material we learn in this game from a historical viewpoint, rather than a doctrinal viewpoint. The scenarios in the game cover the first 150 years of church history, and the theme index (did I mention how much I like that it was included?) explores church history even more deeply for those players who are interested. You can keep informed about Chara Games on Facebook and Twitter. The second game coming out from Chara Games is a card game called 3 Seeds. To read 69 other honest and fair reviews from members of the Homeschool Review Crew, please click the banner just below.